A great find for an out of print children's cotton fabric. 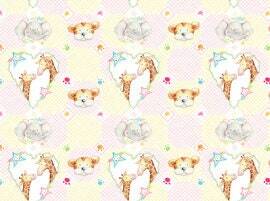 This adorable fabric illustrates giraffes, elephants and tigers enjoying their day. Delightfully soft shades of pink, and yellow gingham cotton make this fun animals come to life. All fabric from The Quilted Nursery Fabric Store is cut directly from the bolt in continuous yardage. We now offer fractional yardage cuts for your quilting, sewing and crafting convenience. Shipping within 24 hours except for Sunday and holidays. All shipping overages are submitted for refund on day of shipping.